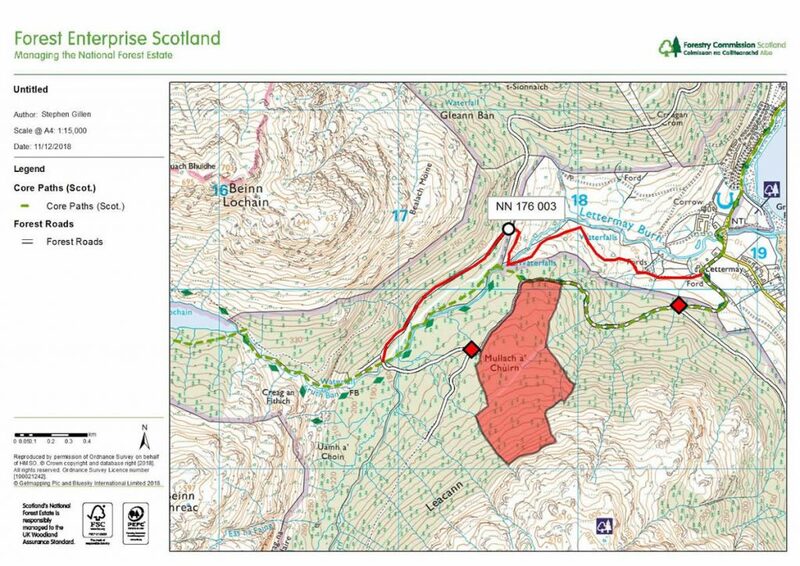 Due to Forestry Enterprise Scotland carrying out timber extraction on the section between Lettermay at Lochgoilhead and Sruth Ban Falls (just before you reach Curra Lochain), there is a diversion in place that will run parallel with the existing path. The diversion will take you onto a quad bike path that follows the Lettermay burn, coming out (depending which way you are travelling) at the Offices/Farmhouse at Drimsynie Estates. NOTE THAT THERE ARE DIVERSION SIGNS IN PLACE, IN EITHER DIRECTION OF TRAVEL. If you are travelling from Lochgoilhead to Strachur, you will turn right off the main road to the entrance to Drimsynie Offices/Farmhouse – Grid Ref OS Map 56-NN 189 006. This is approximately 300m short of where you would turn off at Lettermay. If you are travelling from Strachur to Lochgoilhead, you will turn left when you reach the foot of Sruth Ban Falls. Follow the diversion signs along the Forestry road for about approximately 500m, where you will turn right, go over a small fence and pick up the Quad bike trail that will take you down the Valley to Lettermay. See the map above for more details.